“He had a violent temper and an obstinate self-will, which were not improved by the fact that his mother feared him, and for peace's sake allowed him his own way so far as she was able. He was only twelve years of age when she died. … So for a second time Camillus's efforts to mend his ways came to nothing. He became despondent; his evil habits had the better of him and he seemed unable to control them; he would go back to soldiering again and take his chance. Humanly speaking, Camillus was not a likely candidate for sainthood. His mother died when he was a child, his father neglected him, and he grew up with an excessive love for gambling. At 17, he was afflicted with a disease of his leg that remained with him for life. In Rome he entered the San Giacomo Hospital for Incurables as both patient and servant, but was dismissed for quarrelsomeness after nine months. He served in the Venetian army for three years. Then in the winter of 1574, when he was 24, Camillus gambled away everything he had–savings, weapons, literally down to his shirt. He accepted work at the Capuchin friary at Manfredonia, and was one day so moved by a sermon of the superior that he began a conversion that changed his life. He entered the Capuchin novitiate, but was dismissed because of the apparently incurable sore on his leg. After another stint of service at San Giacomo, he came back to the Capuchins, only to be dismissed again, for the same reason. Again, back at San Giacomo, his dedication was rewarded by his being made superintendent. Camillus devoted the rest of his life to the care of the sick. 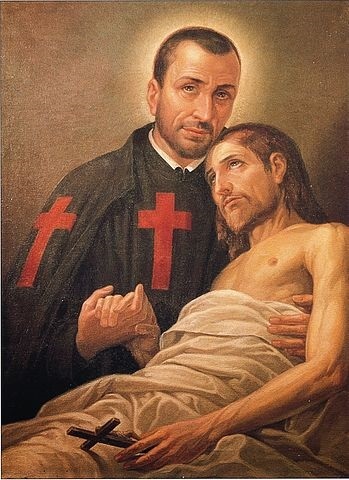 Along with Saint John of God he has been named patron of hospitals, nurses, and the sick. With the advice of his friend Saint Philip Neri, he studied for the priesthood and was ordained at the age of 34. Contrary to the advice of his friend, Camillus left San Giacomo and founded a congregation of his own. As superior, he devoted much of his own time to the care of the sick. Charity was his first concern, but the physical aspects of the hospital also received his diligent attention. Camillus insisted on cleanliness and the technical competence of those who served the sick. The members of his community bound themselves to serve prisoners and persons infected by the plague as well as those dying in private homes. Some of his men were with troops fighting in Hungary and Croatia in 1595, forming the first recorded military field ambulance. In Naples, he and his men went onto the galleys that had plague and were not allowed to land. He discovered that there were people being buried alive, and ordered his brothers to continue the prayers for the dying 15 minutes after apparent death. Camillus himself suffered the disease of his leg through his life. In his last illness, he left his own bed to see if other patients in the hospital needed help. Saints are created by God. Parents must indeed nurture the faith in their children; husbands and wives must cooperate to deepen their baptismal grace; friends must support each other. But all human effort is only the dispensing of divine power. We must all try as if everything depended on us. But only the power of God can fulfill the plan of God–to make us like himself.